A very specific energy wavelength is transmitted to a ruthenium compound immobilized in a sol-gel matrix. The ruthenium will absorb this energy, changing the outer electron’s energy level. The electron will then collapse back to it’s original energy state, emitting the energy as a photon with a different specific wavelength. This is called fluorescing. If the intensity of the transmitted wavelength is tightly controlled, the amount of fluorescing is both predictable and repeatable. If oxygen molecules are present the amount of fluorescing is reduced, referred to as fluorescence quenching. By measuring the amount of quenching it is possible to determine the amount of oxygen present. See our equipment VIDEO on the Optical Dissolved Oxygen Sensor. The Model 10 Dissolved Oxygen Sensor incorporates optical fluorescent technology, solid state electronics, and a unique side mount element. Our optical fluorescent technology provides increased dependability, no sensor caps, no routine calibration and no need for flow, because there is no oxygen consumption. Our side mount element increases impact protection and facilitates the integrated jet clean. Our continuous DO sensors come standard with tool free ¼" O.D. tubing connectors for the integrated jet clean and 33ft (10m) of sensor communications cable. Additional cable length is available upon request. 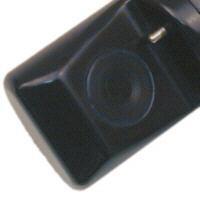 The Model 10 Sensor is our standard sensor mount. This model features all of the above with a PVC 1-1/2" NPT male mounting thread. The Model 10PI Sensor is intended for in-line monitoring in a large diameter pipe. The mount is 2" NPT male thread in 316 stainless steel that works with a customer supplied 2" Thread-O-Let. The integrated jet clean with this sensor includes an inline check valve. There is a flow indication groove on the back of the sensor mount that should be parallel with the flow. Maximum in-line pressure is 20 psi. See the Single Channel Analyzer (SCA) manual for additional information. The Model 10T Sensor is intended for in-line Dissolved Oxygen monitoring utilizing a by-pass loop. The by-pass loop is generally configured using customer supplied full port ball valves on both sides of the tee. 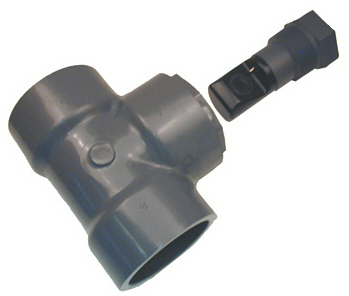 The supplied tee (as shown) is Schedule 80 PVC, with 3" slip connections for process piping and a 2" female NPT connection for the DO probe. The integrated jet clean with this sensor includes an inline check valve. There is a flow indication groove on the back of the sensor mount that should be parallel with the flow. Maximum in-line pressure is 20 psi. See the Single Channel Analyzer (SCA) manual for additional information. The Model 10HT Sensor combines the ease of use of a hot tap mount with the reliability of the InsiteIG DO Sensor. The mount is a 2" NPT male thread in 316 stainless steel that works with a customer supplied 2" Thread-O-Let, saddle or existing piping. The integrated jet clean includes an in-line check valve. There is a flow indicator on the back of the sensor mount that should be parallel with the flow. Maximum in-line pressure is 40 psi.